Multi-use trails can be used by walkers, bicyclists, runners, joggers, those on roller blades, those wheeling strollers, and people in wheelchairs or with walkers. The degree of difficulty ranges from flat, paved paths on level areas of the RiverWalk to steep, wooded and rugged terrain at Camp Smith. Signage and maps designate where the trail is specifically limited to pedestrians and where there are other special conditions for use. Check the maps for available parking areas and entry points. Bike racks and benches are available at some locations. The key to the municipalities' abbreviations follow the path descriptions. Bronx River Pathway: This path is located on the historic county-maintained Bronx River Parkway Reservation between Kensico Dam Plaza and New York City. It is currently developed in three separate sections. Cortlandt Shoreline Trail: This trail follows the Hudson River waterfront between Peekskill and Ossining, following trail alignments planned by the Town of Cortlandt and Village of Croton-on-Hudson. It links three county waterfront parks as well as Peekskill's Riverfront Green. Local roads are utilized where riverfront access is restricted. At the southern end, it utilizes the one-mile “Crossining” Bike Path. Part of Westchester RiverWalk. 14.1 Proposed. Hillside Woods Trail: This trail would link the Old Croton Aqueduct and South County Trailways, following an alignment through Hillside Woods County Park, village parkland, public school lands and Saw Mill River Parkway lands. It is mapped in Hastings’ Community Vision for Comprehensive Planning and Strategic Action Plan, 10/98. A design and feasibility study, funded by a Greenway Conservancy grant, was completed in 2002. Hutchinson River Pathway: The Hutchinson River Pathway would span the southeastern portion of the county from New York City to Connecticut and be developed as a multi-use trail on parkway rights-of-way lands, linking five county parks. It is presently developed as a narrow equestrian trail between Twin Lakes County Park in Eastchester and the I-287 overpass in Harrison. See also Colonial Greenway map. 14.6 Existing nine-mile equestrian path. Proposed. Currently inactive due to unresolved right-of-way issues. 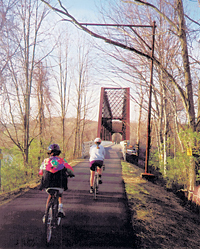 North County Trailway: The North County Trailway is the county's premier rail trail, developed as a paved multi-use trail on the right-of-way of the former Putnam Division Railroad between Eastview in the Town of Mount Pleasant and Putnam County. The final “missing links” sections are currently under construction in the spring of 2002. North County Trailway map 22.1 Completed. MTP BMR OST NWC YTN SOM. Playland Pathway: This existing pathway parallels Playland Parkway, and is situated on parkway lands between U.S Route 1 and Playland Amusement Park. 1 Completed. RiverWalk: The Westchester RiverWalkis a planned 51.5-mile multi-faceted pathway paralleling the Hudson River in Westchester. When completed, it will link village centers, historic sites, parks and river access points via a connection of trails, esplanades and boardwalks. RiverWalk spans 14 municipalities in Westchester and is part of the Hudson River Valley Greenway system. RiverWalk is a work in progress that is being developed through a series of projects constructed by the county, local municipalities and other entities, including private developers. 33 miles existing as paved and unpaved paths, promenades and sidewalks. 6 miles under construction, in design or planning stages. 13.2 miles remaining proposed route. South County Trailway: Like its northern counterpart, the South County Trailway primarily follows the course of the former Putnam Railroad ROW, spanning 14.25 miles from Eastview south to the Bronx, where it continues through Van Cortlandt Park. Elmsford/Greenburgh - 0.5 mile - Route 119 to Warehouse Lane - in design 2013. 14.25 13.75 miles completed in three sections: GRB ELM IRV DBF ARD HAS YON. Tarrytown – Kensico Trailway: This east-west trail links the Bronx River, North County and Old Croton Aqueduct Trailways, and utilizes both on-road (Route 100C, Virginia and local roads) and off-road alignments. 4.9 1.1 miles built. Total off-road multi-use path miles are 133.25 (does not include River Walk miles). Leatherstocking Trail: This inter-municipal hiking trail is situated between the City of New Rochelle and Village of Mamaroneck and links into Saxon Woods County Park. It is part of the Colonial Greenway Trail System. 2.0 Completed.